2. Meanwhile, heat the oil in a large frying pan over a medium heat. Fry the onions for 5 minutes until starting to soften, then add the garlic and ginger; cook for a further minute. Stir in the curry paste and cook for 2-3 minutes. 3. Add the lentils and 500ml water. Bring to the boil, then simmer for 10 minutes. Add the cauliflower and cook, covered, for 8 minutes before stirring in the spinach and cooking, covered, for a final 2 minutes. 4. 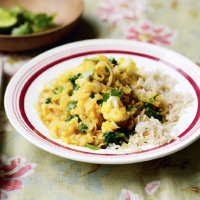 Stir in the lime juice, then serve with the rice and a scattering of the chopped coriander.